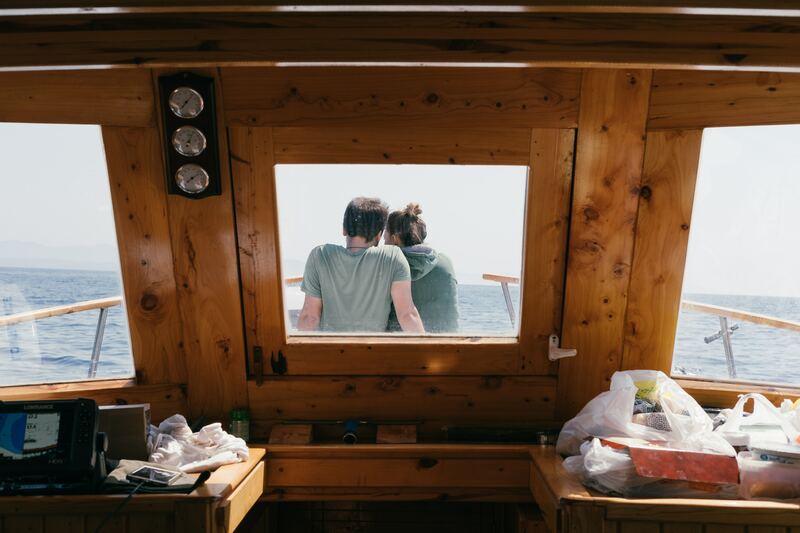 While living on a sailboat comes with plenty of immeasurable positives—serenity, sailing adventures, enjoyment of nature, creating memories with friends and family, etc.—it also involves tradeoffs and ongoing challenges too. In particular, battling the effects of humidity and reducing condensation are probably two of the biggest, unavoidable challenges for boat owners. We’ve learned (sometimes the hard way) how to improve our ways of handling condensation and we want to share those tips with you. How does condensation happen anyway? Well, heat needs a place to go, whether it’s from your body while sleeping, from cooking, showering, or because it’s colder outside than inside your boat. That temperature difference can result in condensation and if it doesn’t have a place to go (and evaporate), then it can result in mildew or mold buildup in your boat (or RV or tiny home). So how do you prevent that from happening? *THIS POST MAY INCLUDE AFFILIATE LINKS, WHICH MEANS IF YOU DECIDE TO BUY SOMETHING WE SUGGEST, WE EARN A SMALL COMMISSION. THIS COMES AT NO ADDITIONAL COST TO YOU, BUT HELPS US CONTINUE TO CREATE GREAT CONTENT, AND WE ONLY SHARE PRODUCTS WE BELIEVE IN. THANKS! The previous owners included their old dehumidifier on board, but after we bought our boat, we thought, Ah, do we really need it? Thankfully, we did keep the dehumidifier and realized it’s a godsend. 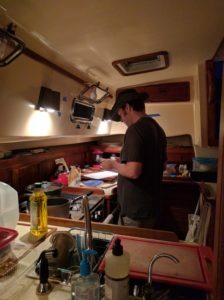 We’ve learned that on rainy or humid days (or if we’re cooking a lot, for instance), the dehumidifier will do its thing, keeping the boat and our stuff dry, and collect several cups of water in a day! This Frigidaire model is highly reviewed on Amazon and is on the “Best Dehumidifier Choice” list. We recommend a 30-pint version for a 35′ boat (or smaller) as it will dry 450 square feet, which is plenty, and obviously takes up the least amount of space. Will you be docked or cruising most of the time when you use it? If the former, you’ll have more options to choose from. Since floor space and storage are high commodities on most sailboats, make sure you look at the overall size and weight. Where will you keep it when in use and where can you store it so it won’t be in your way? Does it hold enough volume appropriate for your size of boat and humidity levels? Ours can hold 70 pints and, on the most moisture-filled days, we’re very glad about this capacity, but it’s possible that we don’t need this much. Can your boat (or whatever electrical system you’ll be using) cope with the load in a safe way? If you’re planning to leave it on when you’re not on the boat too, make sure it includes a humidistat feature, so it’ll stop running when the humidity drops below a certain threshold and an automatic restart feature (especially crucial in the event of a power outage). Keep in mind there’s always a risk, however small, with leaving any electrical device unattended. Does it have non-slip feet and a lower center of gravity, which is better for boats (or other types of homes) that they tend to move around, lessening the risk of the unit falling over. 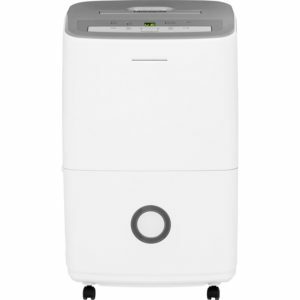 Though our dehumidifier is taller, we make sure to empty it out and set it down horizontally before sailing. When not in use, we store ours under our salon table and, realistically, we use it at least few times a week during the winter and less so during other seasons. Basically, it’s a layer of woven polymer that allows air to circulate and prevents moisture buildup. Brilliant, right? 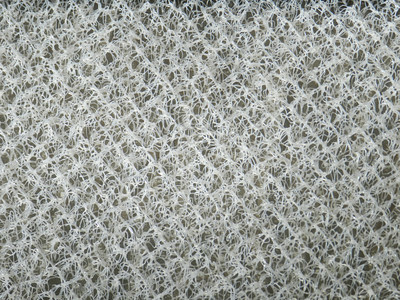 Close up of the woven polymer material. It’s magical! 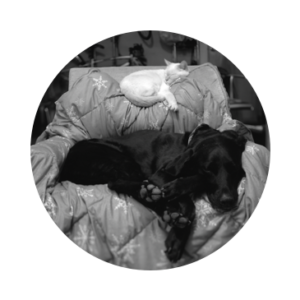 We suggest placing the Aire-Flow barrier under your berth mattress and, if possible, also under and behind your settee cushions (we learned the hard way that moisture buildup can cause mildew in and on the cushions themselves so check them regularly). We used leftover pieces to line our storage lockers. Anywhere that mold and mildew can potentially hide, use Aire-Flow (and get our 5% discount)! Michael cooking like a pro with ports open for ventilation. Using your galley stove for cooking is great, but guess what, the steam that you create from frying, boiling, using a rice cooker, etc. definitely adds moisture to the air and, hence, more moisture inside your boat. 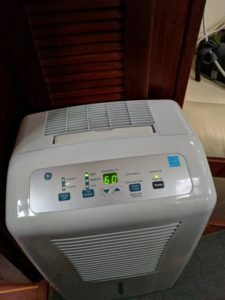 Whenever possible (hopefully on days when the weather is glorious), try to ventilate by opening up nearby hatches and ports, turning on fans, or running the dehumidifier shortly afterwards. Pretty ingenious products—they’re renewable (up to 10 years! ), non-toxic, and don’t require batteries. 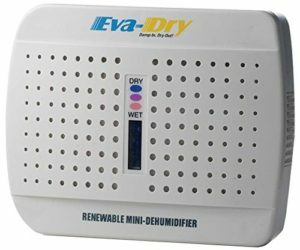 We bought the Eva-Dry E-333 model ($15-18/each) for one of our cubby spaces (apparently works in areas up to 333 cubic feet). So far, so good. We leave it and when the silica gel crystals have absorbed their maximum moisture and turn a dark color (takes about a month or so), we know it’s time to re-charge. We’re definitely considering getting more of them for the boat. One thing to keep in mind is, for small spaces, make sure you have an outlet area wide enough so you can easily recharge the Eva-Dry model that you have. Vinegar and water (1:3 ratio): Not only affordable, but this all-purpose cleaner can help prevent or clean up mildew and vinegar kills about 80% of mold species. 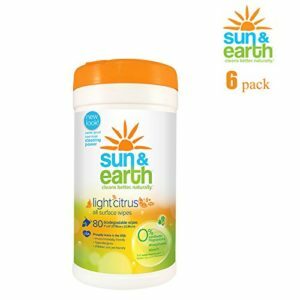 Sun & Earth Natural Biodegradable All Surface Wipes have plant-based ingredients and are biodegradable. With one roll, we placed a layer against the hull liner, behind the settees. A roll (16 Inch x 25 ft Roll) costs between $15-25. Michael used white preservation tape to adhere it as well, which you can find online and potentially in local hardware store. Maintaining air flow is important, so from what we’re learning, passive ventilation options like dorade vents can be great because they allow you have to air circulation, even if the weather isn’t great and they also give warm air a means of escaping too. We purchased a slightly larger version of these cowl vents made by Sea Dog. If you have any questions, please drop us a line at wayfindersnow@gmail.com. We’d love to hear from you!